Production faces many challenges, but food professionals are confident about meeting the demands of a changing market. Editor's Note: This survey included numerous charts and graphic elements that can only be seen in our January issue or in our upcoming E-Handbook, Manufacturing Equipment's Role in Food Safety, available February 12, 2018. Fill out the form on this page to receive your copy of the e-handbook. Call them cockeyed optimists if you will, but food industry professionals are riding into 2018 with great expectations, based on findings in Food Processing’s 17th annual Manufacturing Outlook Survey. Four out of five survey respondents say they either are very optimistic or somewhat optimistic about the prospects for the New Year, the most upbeat attitude in at least five years. At the other extreme, barely 1 percent indicate they are very pessimistic, one-third the ratio of a year ago. Optimism increases with headcount, with respondents from the largest organizations most confident riding into 2018. Those at companies with 50 or fewer employees were relatively downbeat, although the outlook at firms with 51-100 workers topped all demographic categories. The protein sector--meat, poultry and seafood--topped all product categories in terms of positive outlook, closely followed by confections and sauces and condiments. Anticipated increases in plant production help explain survey participants’ expectations. Only 15 percent think throughput will be flat or down somewhat, about half the proportion in the last three years. More expect their facility to rack up double-digit throughput increases than single digits. Expectations for corporate performance are more mixed, with almost half indicating overall production will be roughly the same. One-third believe their facility’s production boost will come at the expense of other plants in the company’s network. Slightly more than half believe facility staffing will increase, the highest proportion in at least five years. Only 6.3 percent foresee staff reductions, another recent-history low. 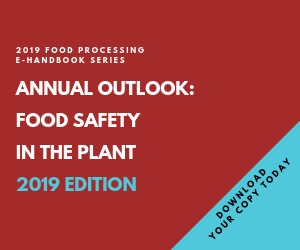 Food safety continues to rank as the top food manufacturing issue, both in terms of overall importance and in the number of food professionals who rank it No 1. Cost control had the second highest average ranking, but worker safety was rated first by a higher proportion, with 17 percent of respondents saying it is the most important issue. More professionals rated automation and capacity expansion as more important than cost control. Almost one-quarter reserve the top spot for food safety. Food safety failures are costly, both in financial terms and in lost public and customer confidence. Some observers put the average direct cost of a recall at $10 million. Almost one in eight survey participants said their companies experienced a product recall in the past 12 months. Mislabeling accounted for more than two in five of those recalls, and one-quarter involved biological, chemical or foreign-material contamination. Another quarter said their firms simply erred on the side of caution and the recalls did not involve a public health danger. Ten percent said suspected product was headed off before reaching distribution. Most food and beverage companies regulated by the FDA now are subject to the preventive controls rules of the Food Safety Modernization Act, though only a small fraction have undergone a FSMA inspection. Most are confident they will survive an FDA inspection, with FSMA readiness ranking as one of the lowest concerns going into 2018. Of even less concern is FSMA compliance by suppliers, although the regulations require verification of supplier compliance. In the run-up to FSMA, North American retailers and major food companies advocated third-party audits and certifications under the Global Food Safety Initiative. Most processors have accepted the idea, with three in five respondents saying they are GFSI certified and one in 10 considering undergoing an independent audit. One in six is certified under a proprietary food-safety standard. Almost one in six reject the idea of any independent certification. The majority of those companies have 50 or fewer employees. SQF remains the most common GFSI-sanctioned safety standard, with 40 percent certified under either level 2 or 3. BRC Global auditors visited 16 percent of respondents’ plants, with one in five undergoing either an IFS or FSSC 22000 audit (combined). Employee training in food safety will be done in 2018 or was instituted last year at 73 percent of respondents’ facilities. Almost half are investing in more equipment for cleaning and sanitation. Other popular actions are the purchase of equipment with improved sanitary design or development or refinement of a hazard analysis, critical control points (HACCP) plan. “We implemented all these (8) items prior to 2017,” wrote one dairy professional, echoing a comment registered by several participants. Cloud-based tracking of quality practices, improved sanitation tracking systems and beefed-up corporate standards for food safety and quality were other practices flagged by respondents. Eight times as many polled readers’ companies will increase capital spending this year than reduce it; half as many will deal with flat budgets. On average, respondents say their firms plan to increase capital expenditures 5.1 percent. Spending plans are as varied as the products produced. New and expanded facilities, equipment replacements and upgrades, more automation and new lines for production and packaging are among the major projects cited. Survey participants were asked to prioritize nine types of capital outlays. Packaging equipment ranked first, followed by replacement of end-of-useful-life equipment with machinery designed with sanitation in mind. Spending on plant and worker safety was next, followed by control systems and electronic records for track & trace and quality management. Laboratory equipment ranked last. Automation vendors tout the digital factory as the new model for manufacturing. The necessary infrastructure includes digital sensors and meters to replace analog devices. While capital expenditures for those field devices ranked as the second lowest priority, two in five respondents say their companies are moving ahead with those types of purchases. The majority indicate their employers are converting to electronic records from paper-based systems. One-third are shifting from local servers to cloud computing and providing more remote access to machine controls. Access usually doesn’t extend to OEMs, however: in seven out of eight cases, OEM access is denied. Getting maximum value from those investments requires maintenance. Presented with eight strategies to optimize asset utilization, 40 percent indicated routine maintenance tasks are being assigned to machine operators. Condition monitoring tools (29 percent) and the hiring of additional maintenance technicians (21 percent) are other popular tactics, with many firms doing both. Growing demand for products with clean labels, non-GMO ingredients and other “free-from” claims impact production as much as it does R&D teams. A majority of participants indicate processes are being adjusted to accommodate these types of formulations, and one-quarter say new equipment and technology is being integrated to manufacture them. Twelve percent report that competition from clean label products is reducing demand for their products, but a higher proportion—21 percent—say throughput at their facilities has increased as a result of the trend. Almost one in five are adding lines or new plants to produce minimally processed products. How is your company meeting the growing demand for skilled workers? 43 percent are expanding in-house technical training, and a third are recruiting maintenance technicians. 23 percent are beefing up in-house engineering capabilities, but 26 percent are doing nothing. Reverting to manual processes is the workforce solution at some firms. One grain-based food processor is “recruiting unskilled labor and placing them in risky situations they cannot begin to fully appreciate,” a manager ruefully noted. Increased outsourcing is the solution of choice at 14 percent of readers’ companies. Pest control is the most frequently outsourced plant service, and the proportion of food companies that have turned this responsibility over to service specialists is growing. This year’s survey found 71 percent of respondents’ companies are outsourcing pest control, up 10 points in two years. Plant engineers are an endangered species, although the frequency of outsourced engineering services has been steady in recent years, with about a third of surveyed companies subcontracting engineering support. Maintenance, logistics management and staff training registered minor dips, but less than one in five plants outsource any of those duties. Companies are trying to get in front of the FSMA “swab-athons” for environmental and product testing. Some or all microbial testing is outsourced at slightly more than half of respondents’ facilities. Sanitation, on the other hand, saw a slight decrease in outsourcing, perhaps an indication that food processors now view this as a critical competency. Meat, poultry and other protein processors were among the first food companies to outsource sanitation, and uncooked protein foods are prime candidates for microbial testing. Half of respondents at protein processors indicated their firms are outsourcing microbial testing. Two-thirds of bakeries also outsource testing, and one in five outsources sanitation. Sanitation and microbial testing are core competencies for dairy processors. Somewhat surprisingly, one in seven dairy-affiliated respondents say those functions are outsourced. Customer demands, regulatory requirements and rapidly evolving technology are putting more stress on manufacturers. Despite those pressures, food professionals are approaching 2018 with quiet confidence. Input for Food Processing’s Manufacturing Outlook report comes from readers who respond to an online survey. This year’s survey was conducted over a four-week period, beginning Nov. 6. A total of 241 readers participated. More than half (56 percent) work at companies with 100 or fewer employees. Another 17 percent are employed by organizations with more than 500 workers. The remaining 27 percent are at firms with 101-500 employees. Further-processed foods and specialties is the category that best describes 12 percent of participants’ companies, followed by protein foods, baked goods and dairy, all representing at least 10 percent of respondents. The rest are distributed across nine product categories. When is the Right Time to Invest in Food Safety? With a strong economy and rising throughput, the money and the need are both there. Hopefully, the good economic times will continue into 2018.